As a graduate of Istrouma High School, I have always felt close to the school, even though it fell on hard times back in the late 1970’s. Two years ago, it was determined to be a “Failing School” and was taken away from the East Baton Rouge Parish School System by the State of Louisiana. Today Istrouma has a new administration and faculty, an all-new coaching staff, and a much smaller student body. It has gone from 1,800 students when I was there in 1965 to 1,000 students five years ago to 250 students today. In a very real sense, Istrouma is undergoing a new beginning, which provides the opportunity for many of its old alumni to get involved and help out. I was pretty upset to see what happened at the Istrouma-Central game last year. Istrouma didn’t have transportation for the team, and so Central coach Sid Edwards sent a Central school bus to bring the Istrouma team to the game. He also fed them and brought them back to Istrouma. At the game itself, there were 3,000 Central fans on the home side and about 50 Istrouma parents and fans on the visitors side. This was unbelievable. Istrouma won nine state championship before I graduated. As recently as 10 years ago, they were ranked No. 2 in the state. But for many years, their program has languished. My fellow Class of 1965 graduate Sammy Tippit and I dropped by the football locker room the other day. We visited with the coaches and players. 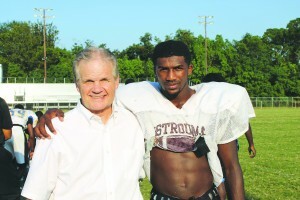 I love the coaching staff at Istrouma. They are some outstanding, dedicated men, real role models, and the football players have won my heart with their great attitude and determination. But the team has so many needs. There’s old beat-up equipment. A locker room falling apart. As a result, we have organized a Facebook group called Istrouma Indian Jersey Club, and we’re starting to get things done such as buy new jerseys for the kids. Friday night, we’re organizing some of our Istrouma alums to come to the Istrouma-Central game, sit on the Istrouma said, and root for the Indians. I was talking to Istrouma star Trie Gibson and asked where he lived. “On Conrad Drive off Winbourne,” he said. “Really? I grew up at 3326 Conrad,” I said. “That’s my house!” he said. After talking awhile, we realized that he and I grew up on the same street, in the same house, and in the same bedroom — 50 years apart! We both attended Istrouma High School and played football for the Indians. It was an amazing and touching moment. The Jenkins family lived in the house from 1959 to 1973. A devastating fire ruined the front of the house, and it had to be rebuilt. Trie was amazed because his house also had a fire. But when they paid a contractor $12,000 to repair the damage, he ran off with the money, and the house has never been fixed. So Trie is living off Ardenwood. But he only scored two — a 77 yard kickoff return and a 65 yard pass interception! The young man obviously needs to work a little harder! Two boys growing up in the same house 50 years apart. It’s a bond that has brought us together in a very special way.